Water is known as ‘The Elixir of Life’. It keeps us vitalized and refreshed, quenches thirst and cools us down in the summer months. It helps us to remove waste products, thins the blood and provides our bodies with the amount of liquid we need. In traditional Chinese medicine, a sufficient supply of water is regarded as an energizer which promotes health. It is interesting to note that the Chinese believe that drinking plenty of hot water can rid the body of excess accumulated moisture such as oedema or water deposits which have been stored somewhere. This leads to an increased urge to urinate and can make you lose some weight. The Chinese don’t sip hot water from there bright Thermos flasks for nothing! We may drink enough, but often of the wrong thing! If you drink half a litre of tap water a day, preferably (filtered), you are certainly well on the way to better skin circulation and activation of the metabolism. The fact is that we drink so many random things which contain water, but not enough pure water. We Brits do in general drink more mineral water than we used to, but we mix it with fruit juices and squash which contain high amounts of sugar and artificial flavourings. Some people think that the mineral water obtained from a wellness drink or the water in green tea is sufficient for a healthy water supply. This is unfortunately a myth as green tea dehydrates and has to be balanced out by drinking two more glasses of water. 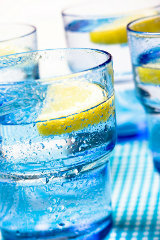 The wellness drink has to be metabolised before the body can use this water, because it contains sugar and flavourings. This means that the water is actually available to the body when this work has been carried out, at which time it has practically been excreted. Pure, still water is the only type of fluid supplied to the body which without exception benefits the body. All of the organs and cells can profit from it as nutrients and oxygen can be transported easier, even through the smallest of capillaries. At the same time toxins, decay products and waste products can be easier and quicker removed. The skin is able to receive one of the most visible benefits from this. Its elasticity and vitality depends to a great extent on a sufficient water supply. Strange though it may be, for a long time there was no scientific studies (to my knowledge) carried out on the subject. I now know of one by the scientist Dr. Michael Boschmann who found that you can actually measure the effect water has on the skin’s circulation or metabolism without having to operate. After skin application, it was discovered that after only ten minutes after drinking water the skin’s circulation is visibly better, oxygen levels are higher and the skin’s metabolism is stimulated. An active metabolism enables the immune functions of the skin and helps to strengthen defence mechanisms. The body is after all made up of a great percentage of water. The skin has to be supplied with water, because it is actually made up of 80% water itself. This is the proof that around a third of the fluid is stored in the body and it makes it easier to understand why every amount of water loss is taken out on the skin. The skin of people who are undernourished ages as quickly as people who have had to go through chemotherapy treatment. The water which is saved in the skin serves among other things to regulate body temperature. We sweat when we are hot so that the water we sweat can cool our bodies down. If the body becomes too hot, for example when you have a fever, sweating is actually able to save your life. The skin is only able to carry out its various functions when it has enough drinking water. Vitality and elasticity of the skin are as dependent on a sufficient water supply as the health and ability to carry out its functions. Whoever is aware of this and appreciates the importance to the skin orders a glass of mineral water with every beer, as beer is dehydrates. Nothing beats water when it comes to preventing the formation of wrinkles.